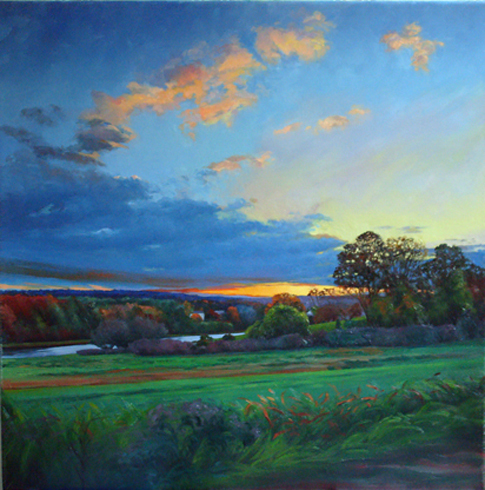 Worcester County landscapes have been my source for artistic expression for many years. I search for locales that are interesting in terms of perspective, individual forms, and illumination. Over the years, I have worked both directly on site and from photographs I have taken. Working on one pastel for several weeks, I apply the medium in numerous heavy layers. I strive to make a dynamic composition come to life in terms of color, texture, light and luminosity. My goal is to create a lyrical feeling for the place. Having worked exclusively in pastel since the early 1980s, in 2006 I returned to my roots as a painter, and am currently working in oil, pastel, and acrylic. My hope is that people who view my work will see their environment with new “eyes”, coming away with a new appreciation for the light, color, and beauty of New England. In addition to Arts Worcester, I am currently represented by Eventide Gallery in Essex, MA and by Silver Circle Gallery in Putnam, CT where I will be having a show in April of 2014. My work is in many corporations such as Dunn Bradstreet and Fidelity Investments.